Due to strict licensing agreements with publishers, electronic library resources such as databases, full text electronic journals and textbooks, as well as other online services are restricted to McGill students, faculty, staff or other authorized users of the McGill Library. Retired faculty and staff also have access to the Library's e-resources. Use of all electronic resources is governed by McGill University's Policy on the Responsible Use of McGill Information Technology Resources. Certain resources may be restricted by faculty, for example, Law, or by location, for example, on campus. In addition, some e-resources may require additional authentication both on and off campus. McGill students, faculty, staff, alumni, or other authorized users can access Library resources from any laptop, workstation or device connected to McGill's on-campus wired or wireless network. In addition, Library e-resources may be accessed by anyone (including guests) using computers located in the Library. Note: Visitors using the eduroam wireless network on campus do not have access to McGill e-resources. EZproxy is a quick, easy, and convenient method to gain off-campus access to McGill Library subscription databases and other online resources. If you are off campus and try to access an electronic resource through the Library web site, WorldCat Discovery, or through the "McGill Library Full Text" links in Google Scholar, you will be asked to log in before you can access the resource. Unlike the Virtual Private Network (VPN), EZproxy requires no prior computer or browser set-up. 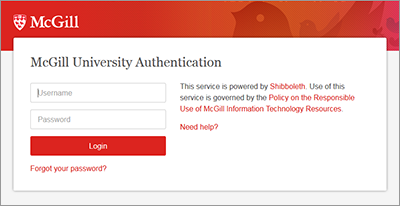 All you need to do is to log in using your McGill username and password when prompted. McGill's Virtual Private Network (VPN) service gives McGill students, faculty and staff access to Library e-resources from home or off campus if you are accessing the Internet using a non-McGill Internet service provider (such as Videotron, Bell Sympatico, etc) or other wireless service. You need to install and configure VPN on your computer or device before you can use it. However, once it has been set up, connecting to the VPN network is simple. The McGill IT web site provides instructions for setting up a VPN connection on different operating systems. Note: As of November 12, 2014, the old VPN, inside.mcgill.ca has been deactivated. Find instructions for setting up the new VPN. For IT help setting up your VPN connection, contact the IT Service Desk. Affiliates (non-McGill staff working in association with McGill) who are on campus can use their affiliate account to access e-resources from any laptop, workstation or device connected to McGill's on-campus wired or wireless network. Affiliates cannot access Library e-resources from off campus locations. For information on access to McGill e-resources for hospital affiliates, see Affiliated hospital access to McGill e-resources. In certain cases, academic departments can request access to e-resources for visiting scholars and guest lecturers for when they are on campus. For more information, the department should contact the head librarian at their branch library. McGill alumni can access a selection of e-resources from off campus. For more information, see: Electronic resources for alumni.